Join us for our fall trail maintenance day. We’ll meet at the Lake Eaton parking lot at 8:30 AM and then gather in teams and disperse to work on different parts of our trail system. Everyone is welcome as we have a list of different projects, some of which don’t include heavy lifting or a need for experience in trail work. The event is rain or shine and contact Paul at plonge1@gmail.com to RSVP or for any questions. Please bring your neighbors and friends as we need all the help we can get! The trails committee held a maintenance day in May. On a rainy Saturday, the team of Kevin McDonough, Frank Krueger and Jim Jacobs gathered to do a wide sweeping clean-up and pruning of the Green trail. 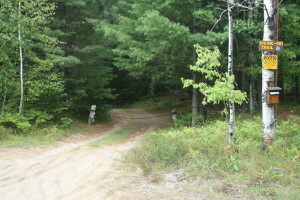 The team started at the AuSable Drive trailhead and worked several miles heading back to the Kitzbuhel area of the Acres. There will be another Trail Day on October 7th. All are welcome to help. Thanks to our trail committee, the trails are looking better and better. We know our members are enjoying them. Last Saturday, May 20th, Bill and Lynne Johnson, Charlie and Elyse Roller, Bob & Lou Moriarty and Kate and Zach Zientko participated in the roadside cleanup which was organized by board members Joe DeMarco and Loyd Brewer. Thanks to our members who have adopted roads throughout the Acres, the cleanup crew focused on side roads. Gerry and Michelle Loughren and Fran Shumway cleaned AuSable Dr. from one end to the other before the scheduled cleanup. I want to thank all those who have adopted roads and who participated in the cleanup. Since all of us have a stake in keeping the Acres beautiful, it is wonderful to have so many helpers. The bathrooms are now open and the water fountain has been turned on for the summer. The tennis court net is up and we have a new volunteer, Jim Jacobs, who will take care of the court. Thanks, Jim. Paul Longenderfer and the trail committee had a work day early in May. They have plenty to do and will have another day in October. Thanks to all the hard workers who keep the trails in such great shape. It is an endless project. I look forward to seeing you on July 1st at the meeting and at the picnic. Another successful trails work day was held last Saturday and our group had beautiful weather throughout. The team replaced a few smaller, crumbling boardwalks with one long bridge over the stream on the Yellow trail. The entire area is stream and wetlands and this bridge will enable AAPOA hikers, bikers and runners access over this area reducing erosion. Kevin McDonough and his dog, Marcy, Frank Krueger, Greg Karl, Jim Jacobs and Laurie George for all the wood carrying, arranging and building. A huge thanks to Kevin and Frank for planning the bridge, buying the wood (fortunately funded by the association!) and pre-cutting. This is the third year of the trails committee and I’m always impressed with the turnout and what we accomplish. Looking forward to our day in the Fall. Until then, enjoy the attached pics. Beginning construction of the bridge.